All photos-except where indicated, courtesy of Kurt Miller. 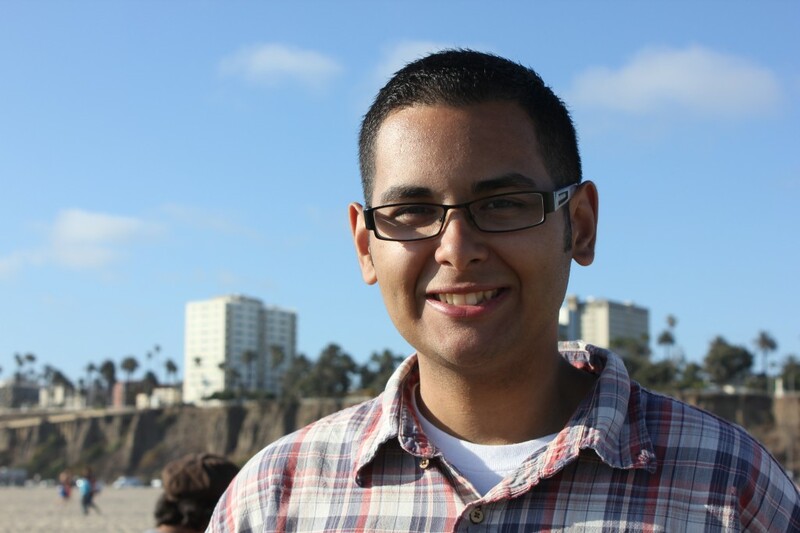 Copyright 2012.
of the author. Copyright 2012. 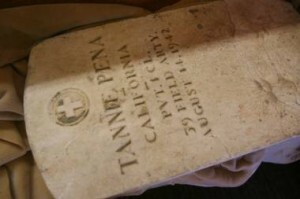 The headstone of World War I veteran Tannie Peña, which went missing for over 40 years from the Agua Mansa cemetery in Colton, Ca. until its return this year. Some people believe in fate. Some people believe in destiny. As genealogists, we believe in serendipity. Serendipity is defined as the accidental discovery of something pleasant, valuable, or useful. It is also defined as a natural gift for making pleasant, valuable, or useful discoveries by accident. And such is the case with the headstone of Tannie Peña . Tannie Peña was my great grandfather’s (Andrew Peña) brother. His real name was Estanislao, but the Anglos could never quite pronounce that. So he went by Tannie. He married Concepcion Garcia (who incidentally happened to be married to Andrew first but then divorced him) and had many children. He served in WWI and resided nearly all of his life in Riverside. Tannie died in Riverside on August 14th, 1942 on his porch of a heart attack. 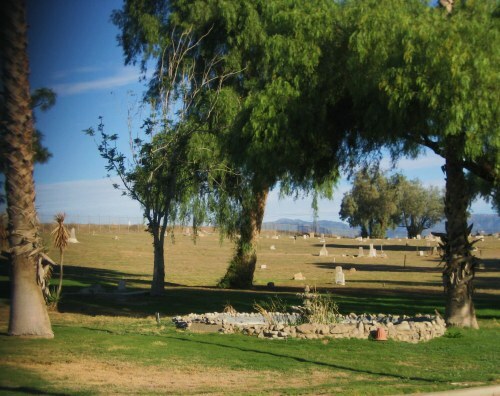 Tannie was buried in the old Agua Mansa Cemetery over across the Santa Ana River in Colton. 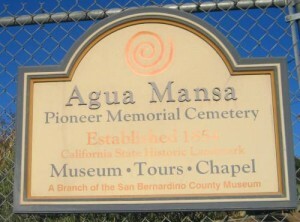 The sign that greets visitors to the Agua Mansa Pioneer Memorial Cemetery in Colton, CA. Photo courtesy of Linda Stienstra. Copyright 2012. The grounds of the Agua Mansa Pioneer Memorial Cemetery in Colton, CA. Photo courtesy of Linda Stienstra. Copyright 2012. The Agua Mansa cemetery has experienced many hardships over the past century and a half. At one time, the cemetery was covered with white crosses that bore the names of those who they represented. But a fire ultimately wiped them out. Many of the headstones have fallen into disrepair and many were stolen throughout the years. Such was the case with Tannie’s headstone which is the subject of this article. According to stories that I’ve heard, Tannie’s headstone went missing sometime back in the 1960s. The thief tried selling it to a local headstone maker, but his plans were foiled and the headstone went back to the cemetery. That was the first time. Exactly when it was stolen the second time is unknown, but it was sometime around 1970. This time the stone would be gone from its final resting place for much longer. Paul Odekirk sits with the 70-year-old tombstone he found and returned to its original placement at the historic Agua Mansa Pioneer Cemetery in Colton on Friday. Photo courtesy of Rachel Luna. Copyright 2012. A series of unknown events would later bring Tannie’s headstone to an estate sale in Highland, California. 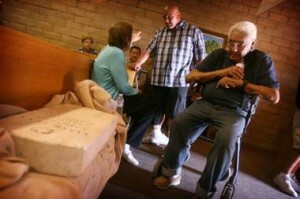 Fortunately for the stone, Paul Odekirk, a Riverside historian, just happened to be there. Mr. Odekirk runs his own estate sales, and it was his company that was running the estate sale that day. Being the historian that he is, he could not let this stone pass by him without a little sleuthing. After some detective work, Mr. Odekirk found out about the Agua Mansa Cemetery and about the name that was carved in the stone. 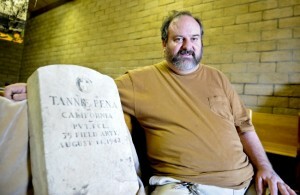 He contacted Michele Nielson, curator of the San Bernardino County Museum and head of the Agua Mansa Cemetery, to let her know that he had found a piece of the cemetery that needed to come back. It was shortly after that time that I received an email from Michele saying that the headstone had been found. 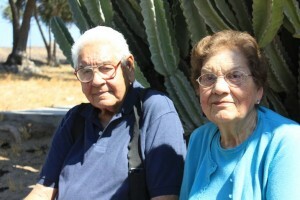 Roy Peña and his sister Clara (Audrey), son and daughter of the late Tannie Peña. Photo courtesy of Anthony Ray. Copyright 2012. Fortunately for her, I knew that Tannie still had two children left: Roy and Clara. I made some calls, and sent some emails, and we were able to notify them that the headstone had finally come back. Roy Peña, 90, looks on at the tombstone of his father Tannie Peña. On Friday, August 31st, many of us gathered together for a mini-family reunion to go to the supposed spot where Tannie is buried. The headstone awaits its return inside of the small chapel museum there on the cemetery grounds. A special reinstallation ceremony will take place during the cemetery’s Dia de los Muertos events. 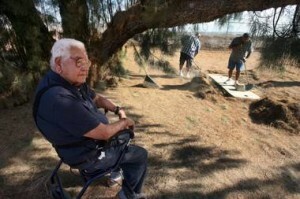 Roy Peña, son of decorated World War I veteran Tannie Peña, looks on as his sons clean up his father’s grave site in preparation for the return of his father’s tombstone, which was stolen over 40 years ago. Some people would say that this is fate, destiny, luck, chance… but I believe this is serendipity. I believe it was an accidental discovery of something pleasant, valuable, or useful. And it was definitely Paul Odekirk’s natural gift for making pleasant, valuable, or useful discoveries by accident. I also can’t help but believe that the connection between the stone and the ground was too great for them to be separated for too long. It had to come back. And back home it has gone. This entry was posted in News & Sports, Photo Essays and tagged Agua Mansa Cemetery, Anthony Ray, Roy, Tannie Pena. Bookmark the permalink. We here at The Los Angeles Beat did not forward the article in question to you. Perhaps its author – Mr. Anthony Ray – did so. Love the family pictures…thanks for sharing! !